The Chadic languages form a branch of the Afroasiatic language family. They are spoken in parts of the Sahel. They include 150 languages spoken across northern Nigeria, southern Niger, southern Chad, Central African Republic and northern Cameroon. 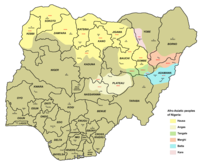 The most widely spoken Chadic language is Hausa, a lingua franca of much of inland Eastern West Africa. Newman (1977) classified the languages into the four groups which have been accepted in all subsequent literature. Further subbranching, however, has not been as robust; Blench (2006), for example, only accepts the A/B bifurcation of East Chadic. (B) the Bade, Warji, and Zaar languages. A chart of the Chadic branch of the Afroasiatic languages. Main Chadic-speaking peoples in Nigeria. Hausa-speaking areas in Nigeria and Niger. Several modern genetic studies of Chadic speaking groups in the northern Cameroon region have observed high frequencies of the Y-Chromosome Haplogroup R1b in these populations (specifically, of R1b's R-V88 variant). This paternal marker is common in parts of West Eurasia, but otherwise rare in Africa. Cruciani et al. (2010) thus propose that the Proto-Chadic speakers during the mid-Holocene (~7,000 years ago) migrated from the Levant to the Central Sahara, and from there settled in the Lake Chad Basin. Chadic languages contain many Nilo-Saharan loanwords from either the Songhay or Maban branches, pointing to early contact between Chadic and Nilo-Saharan speakers as Chadic was migrating west. Although Adamawa languages are spoken adjacently to Chadic languages, interaction between Chadic and Adamawa is limited. Herrmann Jungraithmayr, Kiyoshi Shimizu: Chadic lexical roots. Reimer, Berlin 1981. ^ Hammarström, Harald; Forkel, Robert; Haspelmath, Martin, eds. (2017). "Chadic". Glottolog 3.0. Jena, Germany: Max Planck Institute for the Science of Human History. ^ Cruciani, F; Trombetta, B; Sellitto, D; Massaia, A; Destro-Bisol, G; Watson, E; Beraud Colomb, E; Dugoujon, JM; Moral, P; Scozzari, R (2010). "Human Y chromosome haplogroup R-V88: a paternal genetic record of early mid Holocene trans-Saharan connections and the spread of Chadic languages". European Journal of Human Genetics. 18 (7): 800–7. doi:10.1038/ejhg.2009.231. PMC 2987365. PMID 20051990. ^ Ehret, Christopher. 2006. The Nilo-Saharan background of Chadic. In P. Newman and L. M. Hyman (eds), West African linguistics: studies in honor of Russell G. Schuh, pp. 56-66. Studies in African Linguistics Suppl. 11. Columbus: Ohio University Press. ^ Blench, Roger. 2012. Linguistic evidence for the chronological stratification of populations South of Lake Chad. Presentation for Mega-Tchad Colloquium in Naples, September 13-15, 2012.